Defensive driving goes beyond following traffic laws and procedures. It involves anticipating situations, rather than reacting to them, and making safe, well-informed decisions based on road and environmental conditions. Defensive driving means understanding a vehicle’s capabilities and limitations, and maintaining control while maneuvering it away from hazards. Why Provide Defensive Driving Training? Auto physical damage claims continue to be the most frequently reported loss by members. Training drivers to be safe does more than protect a member’s fleet from physical damage; it also helps prevent injuries to employees and citizens. The defensive driving training offered to members through MCIT is designed for those employees who drive as part of their job duties on behalf of the member organization. MCIT offers two formats for defensive driving classes: online and onsite. The options are provided at no charge as part of MCIT membership. Note: Members looking to provide general safe driving instruction and information to its employees regardless if they drive on behalf of the member for business are referred to the Minnesota Safety Council’s options. Previously, MCIT has offered a 40-minute online program through a third-party vendor. Currently the vendor is having problems with its system, and the course is unavailable. *Certificates of completion are issued to participants; however, members should not confuse the MCIT-sponsored sessions with the four- or eight-hour National Safety Council courses. For more information about or to schedule defensive driving training, members should contact MCIT Internal Services at info@mcit.org. MCIT pays for up to two sessions of on-site training for defensive driving per member per year. Additional sessions can be scheduled at a cost to the member. When a member requests two sessions, they must be scheduled for the same day. To cancel an on-site class, members must give five days of notice or be subject to a cancellation fee. Members also have access to other resources that reinforce safe driving habits. “Seat Belts Must Be Worn” stickers: These are great for placing at exits and in vehicles, and are available in two sizes. Members can request stickers at no cost by contacting MCIT. 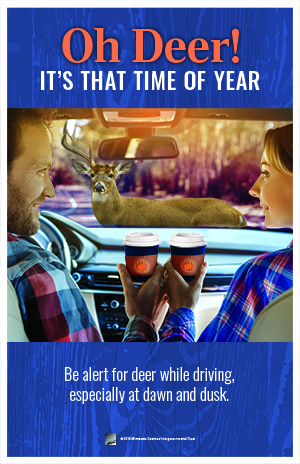 Deer collision prevention and awareness materials: Posters, lockscreen images and an animated video remind drivers to slow down, scan for deer and to take appropriate action when encountering deer on the road. Minnesota Safety Council: Members have access to a number of resources and additional courses, including mature driver classes and “Alive at 25,” to help reinforce safe driving habits among its employees. Many of the resources are free, but some are offered at a modest cost. All MCIT members have a membership with the Safety Council as part of participation in MCIT.